The winners of the giveaway can now be named! Selected at random from the comments here on WDN was username “Kenji”, and selected at random from the comments on Facebook was Adam Taylor. You will both receive a FREE pair of the Brock gloves – look out for a message from us soon to arrange shipment of your prize. 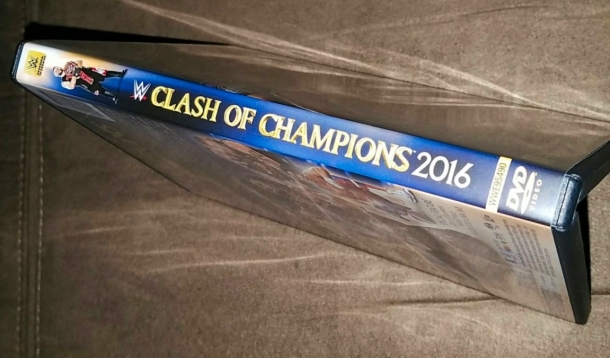 Clash of Champions 2016 is the next WWE DVD on the horizon. It will be officially hitting stores across the United States a week tomorrow, one of 3 releases planned for November! Be sure to pre-order your copy for the low price of only $9.22 by clicking here to Amazon.com. As you will recall, the RAW-branded PPV event was headlined by Seth Rollins vs. Kevin Owens for the WWE Universal Championship, Roman Reigns vs. Rusev for the United States Championship, Sasha Banks vs. Bayley vs. Charlotte in a Triple Threat for the RAW Women’s Championship, and it also featured the first defense of the returning Cruiserweight Championship. Thanks goes out to WDN reader “JayJayRock206” for the early pics. Ever since the WWE Universal Championship ended up in the hands of Kevin Owens, Seth Rollins has had only one goal in mind… derail “The Prizefighter’s” championship run and reclaim the richest prize in sports entertainment. At Clash of Champions, “The Undisputed Future” hopes to stop The Kevin Owens Show dead in its tracks in the main event of RAW’s first pay-per-view of The New Era. The WWE RAW Women’s Champion Charlotte defends her championship against two of her greatest opponents, Sasha Banks and Bayley, in a Triple Threat Match. The rivalry between Roman Reigns and Rusev continues in a match for the United States Championship. The New Day hopes to continue their historic title reign, and TJ Perkins for the first time ever, defends the Cruiserweight Championship. The Superstars of RAW go for the gold on WWE’s most golden night of the year. – USA: Landing NEXT WEEK! Pre-order your copy now here on Amazon.com. – UK/Europe: Out November 21st. Pre-order the DVD (or Blu-ray) on Amazon.co.uk. – Australia: Out December 7th. Pre-order your Clash of Champions DVD at Madman.com.au. Wish backlash 2016 & No Mercy 2016 can be on DVDs. Else 2016 PPV collections are not completed. Thanks guys. Here Comes The Pain!!! congrats to the lucky buggers who won the lesnar fight gloves. What is with the WWE screwing the North American market out of Blu-rays. The DVD quality isn’t the same. Looks like I’ll have to consider investing in a Region Free Blu-ray player. They really aren’t that expensive. You can get one off ebay for about $150 (or cheaper) if you look hard enough. The Network quality is even better than DVD. As for a region free player, i highly recommend one. I got an Oppo BDP-93 back in 2012 with a region free kit that is attached to the back and you just have to press few buttons followed by 1 (region A), 2 (region B) or 3 (region C) and you unlock it – i have it programmed on my Harmony remote so its easy. Its considered one of the best Blu-ray players due to reliability and build quality. They don’t make them anymore but there are tons of region free BD players on Amazon, usually sold by a third party that hardwired region free compatibility. Prices are pretty good for a Sony, Panasonic, Samsung, LG, etc. I have most of the WWE UK PPV imports as I have been buying them when Amazon UK drops the price on them. Still have to buy most of 2015 and 2016 to get caught up.